The article explores the role of the American super-vendors and note that in Germany, they’re called Datenkraken, which I rather like. 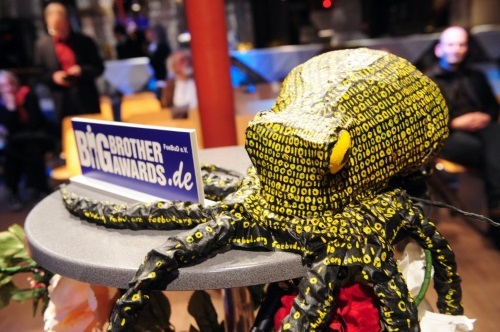 The article in the paper had a picture of a huge model of an Octupus (or Kraken) embellished with binary code. (I had always thought of the Kraken as a sea serpent.) I reckon I found the datenkraken here, the Guardian’s picture was different. The Commission has been looking at how to incubate a more successful IT industry since Europe lost its lead in mobile phones. It would seem to believe that regulating the monopolistic behaviour and tax structuring of some of the US competitors is part of the answer. The last word is left to Mathias Döpfner, CEO of the Axel Springer Group, one of Germany’s biggest media conglomerates. He’s allowed to wrap himself in the blue flag and yellow stars claiming to represent the European public interest. The fact is that allowing the debate to be framed around the commercial interests of either New Technology or Old Media means that we are likely to miss out on the citizens real interests.